Betfred has framed a market on the number of English Premier League teams that will change its manager during the coming season and one thinks that the bookmakers has gone too high. The line that Betfred has set for trading purposes is eight and a half, most likely because its odds compilers have not gone much further back in the history books than last term. The 2013-2014 English Premier League season was a record one for managerial changes. Ten bosses vacated their position during the campaign. Sunderland manager Paolo Di Canio was the first to go on 22 September and he was followed by Crystal Palace’s Ian Holloway (23 October), Fulham’s Martin Jol (1 December), West Bromwich’s Steve Clarke (14 December), Tottenham’s Andre Villas-Boas (16 December), Cardiff’s Malky Mackay (27 December), Swansea’s Michael Laudrup (4 February), Fulham’s Rene Meulensteen (14 February), Norwich’s Chris Hughton (6 April) and Manchester United’s David Moyes (22 April). Fulham changed its boss twice so Betfred would have resulted on nine sides. 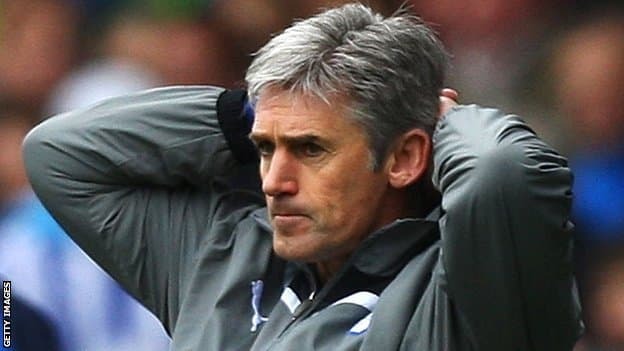 Five English Premier League teams – Chelsea, Queens Park Rangers, Reading, Southampton and Sunderland – changed their manager during the 2012-2013 season. Four English Premier League teams – Chelsea, Queens Park Rangers, Sunderland and Wolverhampton – changed their manager during the 2011-2012 season. Four English Premier League teams – Blackburn, Liverpool, Newcastle and West Bromwich – changed their manager during the 2010-2011 season. Five English Premier League teams – Bolton, Burnley, Hull, Manchester City and Portsmouth – changed their manager during the 2009-2010 season. There were wholesale managerial changes during the 2007-2008 and 2008-2009 English Premier League seasons but neither campaign saw more than eight teams change managers. Before stepping in to back under eight and a half English Premier League teams to change managers during the coming season at odds of 91/100 1.91 -110 0.91 -1.10 0.91 with Betfred one should review the employment prospect of the 20 bosses who will kick off the campaign with the weight of the world on their shoulders. One should never say never in football but one thinks that five English Premier League managers are almost certain to see out the season, with those rock-solid bosses being Arsenal’s Arsene Wenger, Everton’s Roberto Martinez, Liverpool’s Brendan Rodgers, Manchester City’s Manuel Pellegrini and Manchester United’s Louis van Gaal. And one thinks that the odds are firmly in favour of Chelsea’s Jose Mourinho, Crystal Palace’s Tony Pulis, Hull’s Steve Bruce, Southampton’s Ronald Koeman, Stoke’s Mark Hughes and Tottenham’s Mauricio Pochettino sticking around also. One thinks that Aston Villa’s Paul Lambert, Burnley’s Sean Dyche, Leicester’s Nigel Pearson, Newcastle’s Alan Pardew, Queens Park Rangers’s Harry Redknapp, Sunderland’s Gus Poyet, Swansea’s Garry Monk, West Bromwich’s Alan Irvine and West Ham’s Sam Allardyce are genuine contenders for the chop but, barring any unforeseen casualties, it would require all nine of them to go to spoil the fun of an under punter. Only a finite number of sides can occupy positions in the English Premier League relegation zone so, unless there is continual movement on the bottom half of the ladder, some of the teams are not going to have the reason to replace their manager. Betfred has set its exotic line too high. Managerial changes are inevitable because English Premier League membership is worth millions of British pounds and it is easier to change one manager than it is to change 11 players but eight and a half is a line at which one cannot foresee two-way trade. Recent English Premier League history suggests that Betfred should have set its exotic line at either six and a half or seven and a half, with a slight lean towards the latter from a trading perspective even though the pure numbers suggest that there would be very little wrong with the former. Do not delay: back under eight and a half English Premier League sides to change its manager before Betfred either trims its odds or moves its line to seven and a half.